"I believe arts education in music, theatre, dance, and the visual arts is one of the most creative ways we have to find the gold that is buried just beneath the surface." Our children are inspired and motivated by the different aspects of the Arts curriculum, enjoying the many opportunities to express themselves through art and design, music, drama and dance. These vehicles for personal expression, reflection and emotional development help pupils to better understand themselves, and relate to others and the wider world. At West Bretton we believe in the importance of the Arts and, as one of our curriculum drivers, we dedicate time to them in every topic. In 2010 we attained Artsmark Gold and we are looking at applying for the award again. 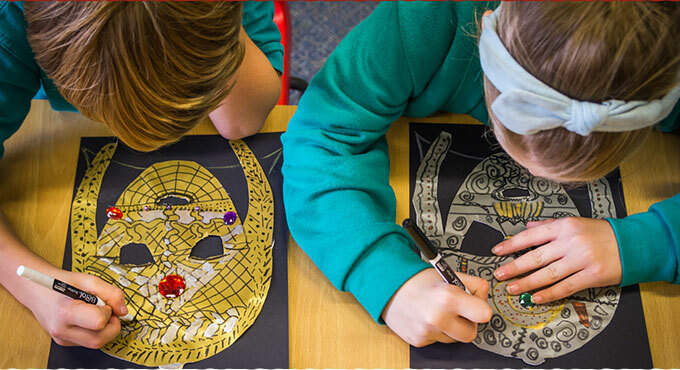 Through art, craft and design activities children learn to make informed valued judgements and aesthetic and practical decisions, becoming actively involved in making images, objects and learning to shape their own environment. The children use a variety of different art forms in each year, and study the works of famous artists. The Yorkshire Sculpture Park and The Hepworth Gallery are used to enhance our art and design provision. The teaching of music improves children’s ability to listen to and appreciate a wide variety of music and to make judgements about the quality of what they hear. Motor skills and hand-to-eye co-ordination are practiced, and left-to-right orientation is reinforced when reading from notation. Social skills are developed in co-operative group work and when listening to and appraising the work of others. Class 3 (Year 3/4 pupils) has a weekly music lesson led by Wakefield Music School. All Year 4 children learn to play a brass instrument and are loaned one for the year, having a weekly lesson in school time. In addition to this, a large number of our Key Stage 2 children choose to learn to play the violin. These lessons are given in a small group basis from Wakefield Music School. Drama and role-play provide the opportunities for children to express feelings and co-operate with their peers in a safe and structured environment. They also enhance understanding of other subjects such as History, Literacy and PSHE. Children take part in drama opportunities through their Literacy and topic work as well as putting on performances at Christmas and at the end of the year. Each class also puts on a parent assembly every year during which the children get the chance to demonstrate their drama and performance skills to a wider audience. In our Early Years, role play can be seen daily, both indoors and out, developing our children’s imagination and confidence. The teaching of dance brings together active involvement in different forms of music and drama, increasing self-discipline, creativity and self-esteem. Dance is a unit of PE studied each year in every year group. As well as curriculum time allocated to these subjects, our school produces a performance in each Key Stage in the summer term, together with parent assemblies, carol services, Nativity performances and community concerts. These can include all the Art forms, singing and instrumental work, dance and drama, designing and making costumes and scenery. In addition to this we have had after school art clubs, and our Glee Club sings on a weekly basis. The school also holds special Arts weeks where we work with artists from the Yorkshire Sculpture Park’s Ignite project. This involves work across a range of art forms.